HO CHI MINH CITY, Vietnam — Talk about an extreme makeover. Once synonymous with war and genocide, Vietnam and Cambodia are coming into the second decade of the 21st Century as one of the world’s premier honeymoon hot spots. Last week, Virtuoso, a leading luxury travel network in the U.S., unveiled the 30 Top Honeymoons chosen by some of its most experienced honeymoon specialists. And Vietnam and Cambodia were prominent on the list. The Caribbean? Greek Isles? Honeymooners have been there and done that. Now, they’re raising the bar on their expectations. In its current honeymoon campaign, Virtuoso looked to TheKnot.com, the No. 1 online wedding planning resource, to create an email and website promotion that will be viewed by millions of registered brides-to-be. 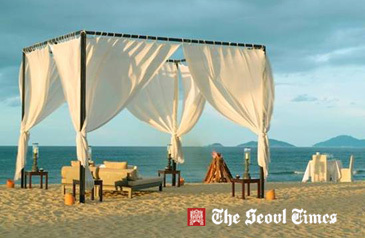 The nine-night escape to Vietnam and Cambodia includes stays at The Nam Hai in Hoi An, Sofitel Legend Metropole Hanoi and Siem Reap’s Hotel de la Paix — three of the premier properties in Southeast Asia — for $8,096 per couple. Renowned regional tour operator, Trails of Indochina, takes care of the ground transportation. The trip is arranged by TravelCorp International’s Luke Breaux, one of 24 featured Virtuoso honeymoon specialists. The U.S.-based consultant has 15 years experience arranging memorable itineraries for visitors to Southeast Asia. Situated on 35 hectares of landscaped tropical gardens, The Nam Hai is an all-villa property managed by GHM and featuring 60 one-bedroom villas and 40 pool villas ranging from one to five bedrooms, each with its own infinity pool. Opened in 1901, Sofitel Legend Metropole Hanoi reigns as the Grande Dame of Vietnamese hospitality and one of Southeast Asia’s most iconic hotels. In 2009, the hotel became the first in the Sofitel portfolio to acquire Accor’s Legend brand distinction. Located in the heart of Siem Reap, close to the cultural and historic heart of Cambodia, Hotel de la Paix is a luxury boutique hotel within easy reach of colorful markets, vibrant nightlife and the breathtaking complexes of Angkor Wat, often referred to as the eighth wonder of the world. Full details of the Vietnam and Cambodia honeymoon may be found at: http://offers.virtuoso.com/350065/honeymoons_nam.html.